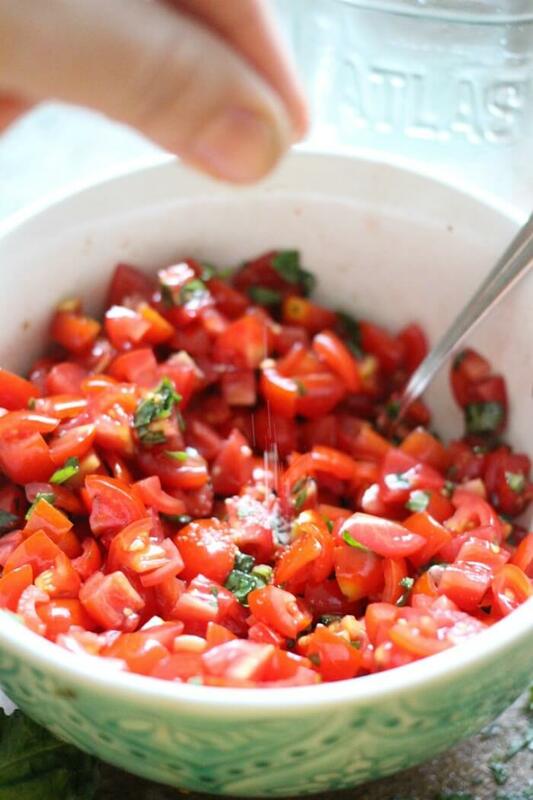 Bruschetta made with fresh tomatoes, basil, and olive oil is the ultimate bright and yummy appetizer. Everyone will want the recipe! Bruschetta historically refers to a toasted Italian bread drenched in olive oil and served with garlic or tomatoes, but these days most folks are referring to just the topping when they talk about bruschetta. I mean, bread is great and all, but bright red tomatoes? Fresh basil? Balsamic vinegar? These are the things that make our hearts sing. Bruschetta is basically the Italian equivalent of pico de gallo (see also: fresh delicious goodness that tastes great on everything) and I like to serve it as an alternative to marinara sometimes. It’s just so summery and full of yesssssss. I love to serve this as an easy appetizer before our lazy lasagna, on top of crispy chicken thighs, or as bruschetta fish. This post was originally published in collaboration with Farm Rich. All recipes and opinions belong to Mama Loves Food. 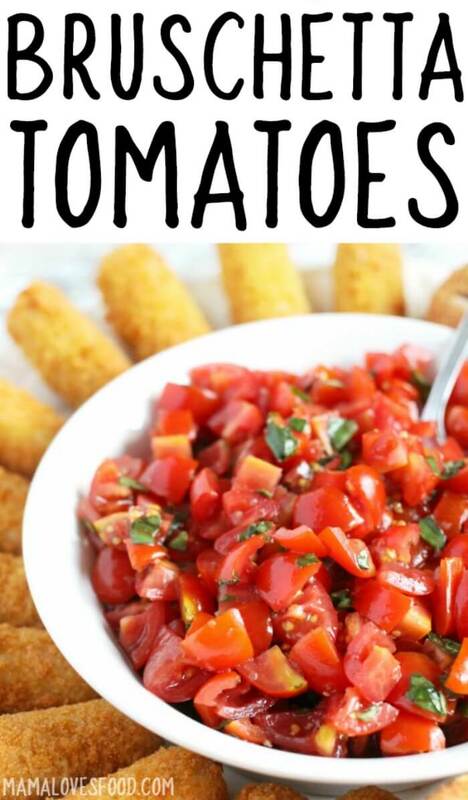 Tomato – I adore sweet cherry tomatoes for this recipe, but roma or vine ripened work as well. Just make sure they are nice and ripe. Basil – Normally I am a fan of dried or pre-packaged herbs as a way to make a recipe easier, but in this case I’m going to ask you to definitely use fresh basil. If you don’t have a basil plant you can generally find fresh basil leaves in the produce section of your market. Olive oil – If you love the flavor of olive oil, then go for something bold, but if you don’t or you’re not sure, then start with a light olive oil. Whatever you do, don’t sub with a different type of oil though! Balsamic vinegar – Oh, I think I would be happy to put balsamic vinegar on just about everything. This is the acid that will brighten up all the ingredients and bring them together. Yum, yum! Garlic salt – You can use plain salt and fresh garlic cloves if you like, but I find garlic salt works fine and then you don’t have to worry about that zing if you bite into a bit of raw (spicy!) garlic. optional: red onion – a bit of shaved or minced red onion goes beautifully with this recipe! How do you make bruschetta? Bruschetta is made by starting with your choice of bread sliced, then toasted – sometimes rubbed with garlic and drizzled with olive oil. Top with a mixture of tomato, basil, olive oil, garlic, and vinegar. What kind of bread is used for bruschetta? Bruschetta typically uses Italian bread, toasted baguette or rustic bread. French bread baked into a baguette would work, and it would even be delicious on an artisan style no knead bread. If you wanted to be unique you could even put it on top of a fresh baked pizza dough. Mmmm. 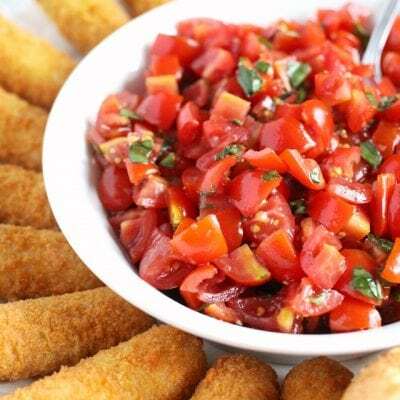 I served my Bruschetta topping with Farm Rich Breaded Mozzarella Sticks and Mozzarella Bites. It would also be heaven on the Toasted Ravioli, but my market was all out. (((sad panda))) I grabbed these Farm Rich appetizers on a quick trip to Walmart along with the fresh produce to make our Bruschetta Topping. 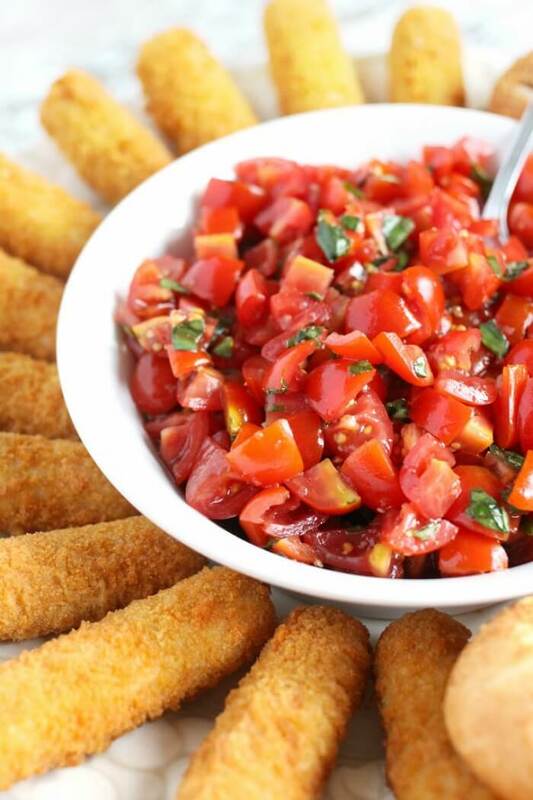 You can also watch us make this bruschetta recipe on YouTube! Make sure to tune in for all our live cooking shows! 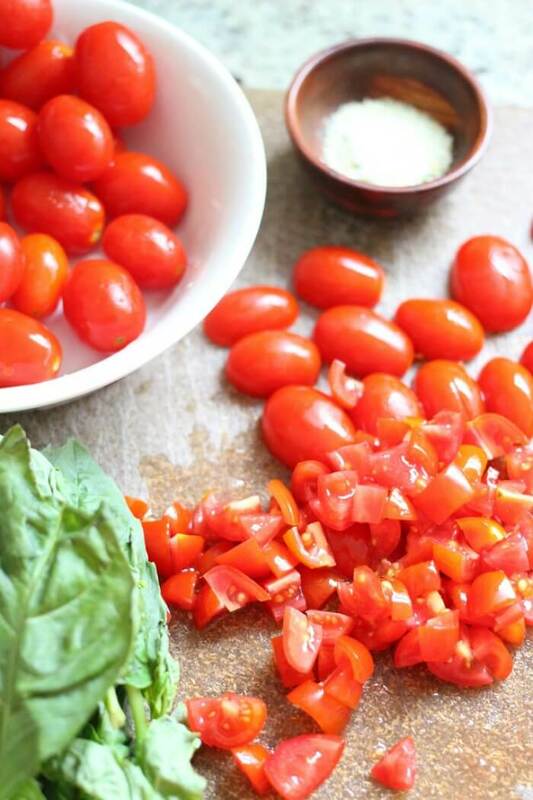 Add tomatoes and basil to a bowl, drizzle with olive oil and balsamic vinegar. Sprinkle with garlic salt. Taste and adjust proportions as needed. This recipe was originally developed for FarmRich 6.27.15. Mama Loves Food was compensated for the associated time and work. All opinions and recipes are mine alone. Loved the suggestion to try it on top of pizza dough – such a tasty and versatile recipe! Something simple but delicious – I love your tip about using garlic salt. I’ve always been a risk-taker with the plain salt and garlic cloves. Gotta try it with garlic salt next time! i love bruscettas as it is my daily snack, this recipe will surely help me enhance the flavor the next time i make which is going to be tonight!